The Szabadság híd or Liberty Bridge, sometimes called the Freedom Bridge, is Budapest’s third southernmost bridge. On the Buda bank, it ends at the foot of Gellért Hill, with the Gellért Spa and Hotel Gellért nearby. On the Pest bank it ends in Fővám Tér near the Greta Market Hall and the Budapest University of Economics. 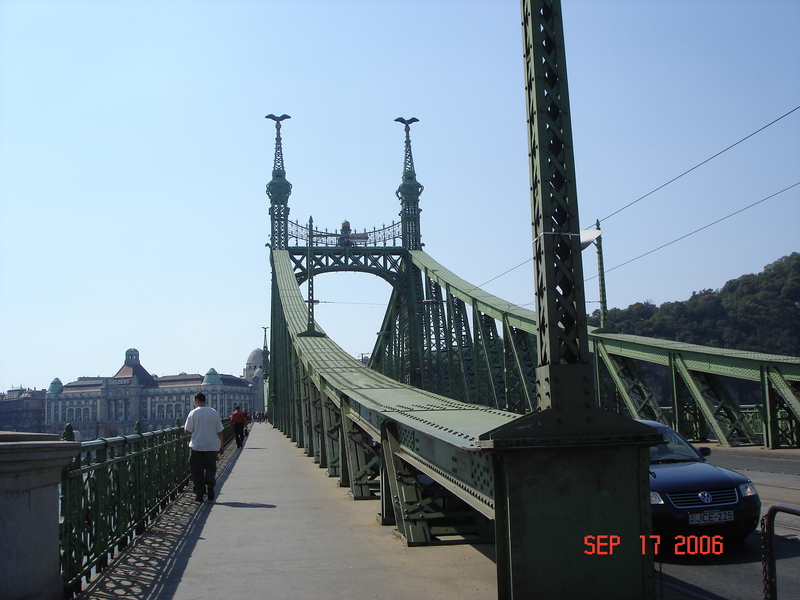 The Liberty Bridge was designed by Janos Keketeházy and completed in 1896. It is 333.6 metres long and 20.1 metres wide. While its structure is different, its shape follows that of the chain bridge. The top of the four masts are decorated with large bronze statues of the Turul, a falcon-like bird which is prominent in ancient Hungarian mythology. The bridge was originally named after the doomed Emperor Franz Joseph, who officially opened it and nailed in the last silver rivet on the Pest abutment. Petőfi híd or Petőfi Bridge, named after Sándor Petófi the poet who inspired the revolution of 1848 is the second southernmost public bridge in Budapest. Designed by Pál Álgyai Hubert it was built between 1933-1937, it links Boráros tér on the Pest bank of the Danube with Goldmann György Tér, next to the Budapest University of Technology and Economics on the Buda bank. Lágymányosi híd or Lágymányosi Bridge, sometimes Lágymányos Bridge, is named after the south Buda district of Lágymányos. Opened in 1995, it is Budapest’s southernmost and the newest public bridge.